Why should I vote for the Green Party in elections? In recent years, many of us have been disillusioned with politics. * the only party to oppose Heathrow expansion on principle, not expediency. The Green Party has radical new ideas on the economy, welfare, health, housing and education. When we are voted into office, we make a real difference for the better, as shown by our members of the British Parliament, European Parliaments, the London Assembly, Scottish Parliament and a growing number of local councils. And we are popular with small businesses too – in the last election for London Mayor, the Federation of Small Businesses gave its support to the Green Party candidate, Siân Berry. All of the main parties have been tainted by the expenses scandal. On the other hand, Green Party politicians have been absolutely above board in their behaviour. Our MP, Dr Caroline Lucas, has been made the Observer’s Ethical Politician of the Year not once – but twice. Now let’s look a bit closer to home. Why should you vote Green in local elections? 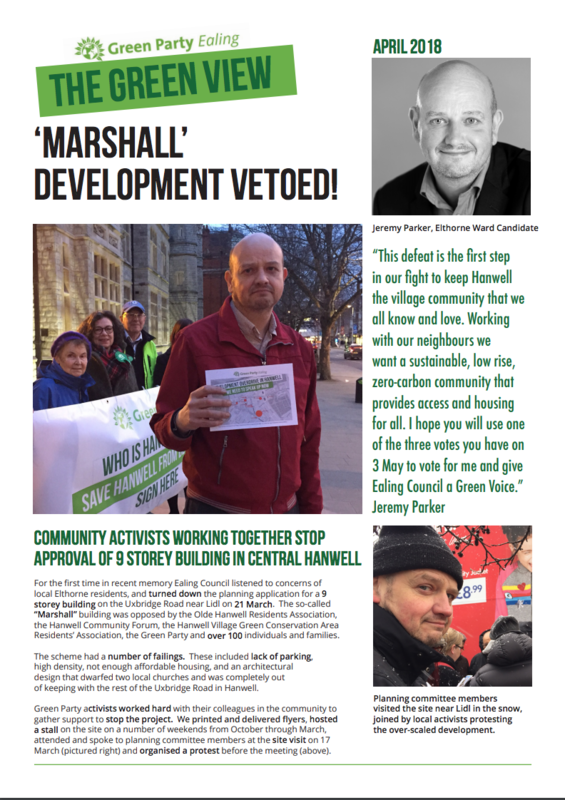 The Ealing Green Party is the only local party with a desire to stand up to a council that approves big developments first and thinks about the consequences later – if at all. The Ealing Green Party is committed to protecting green spaces around the borough, like Warren Farm and Northfields Allotments. The Ealing Green Party is fighting for local people to mitigate the environmental damage that the expansion of Heathrow and HS2 will cause. The Ealing Green Party recognizes that the controlling party of the local authority badly needs accountability. Even some members of the controlling party agree with this. So if you want a fairer, more equal society which puts people and the planet before profit, use your voice in all elections. Vote Green! The Green Party – Fair is worth fighting for!